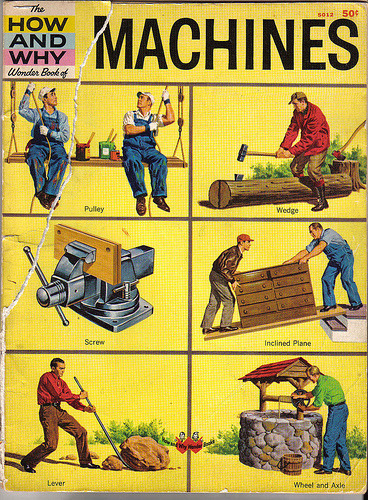 Several years ago I wrote an article entitled “Technomania… has it gone too far?” where I discuss that simplicity tends to be more reliable and cite the classic six simple machines as defined by Renaissance scientists. Simple machines have existed for millennia and were used to construct the Egyptian pyramids! 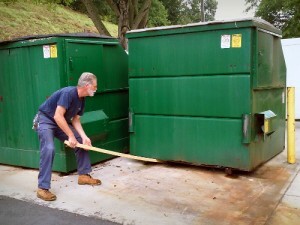 I had an opportunity this week to move some large steel garbage bins using a single six foot two-by-four stud. By placing about six inches of one end underneath the bin I could leverage it off the ground and shift it toward my destination and by repeating the process reached the final position. It reminded me of a great saying… “give me a long enough lever and I can lift the world”. I remember being amazed that my elderly father was able to move his dismounted camper across his driveway by himself using a number of pipes as a series of rollers. He levered up the front end of the camper and placed a pipe underneath… rolled it a foot or so and kept adding pipes in parallel until they supported the full length of the load. As he would advance the camper and leave behind a pipe he would take it to the front to repeat the process and thus rolled it all the way to his destination. These are only two examples of simple machines but it illustrates common difficult tasks that perhaps one person could accomplish using them. The beauty of simple machines is that they can be improvised using materials at hand. Click HERE to see the application of simple machines. I would encourage you to familiarize yourself with them because they may be just the thing that you’ll need for a weekend project or perhaps for an emergency that could save your life. This entry was tagged Emergency, Improvise, Simple Machines, Tools. Bookmark the permalink.